Is a Runwaysite For You? Spring is the time for new beginnings: flowers are blooming, birds are chirping, baby animals are wobbling around, companies are getting Runwaysites. You read that right. Runwaysite websites are an affordable way to update an old website with a fresh and professional new look, to get found on search engines, and to provide accurate and current information to your customers. Runwaysites have myriad uses, for small to medium-sized businesses. They are perfect to develop a much-needed presence on search engines, and to have a place to direct traffic to from a Facebook page. Because they are both mobile and Google friendly, your users will be able to easily find and navigate your website on any device. Businesses hosting or attending large events, like those in the tourism industry, can use a Runwaysite as a call-to-action for the event. Instead of directing traffic to their full website, and then to a specific calendar event, a Runwaysite with an event-specific URL is much easier for the hosts to promote and the attendees to find. Because these sites are fully customizable, the header, color scheme, and/or logo can all remain consistent with the full website, but have its own content geared towards the event. Similarly, when attending conferences or trade shows, Runwaysites can be used to get key details front and center, but still provide more in-depth company information on a full, separate website. Small retailers that want to sell their product, but don't have the need or funds for a full e-commerce site can benefit from having the online presence with a Runwaysite. Through this avenue, they can market their product, and build awareness for their brand, while directing sales through a third party provider such as Etsy or Shopify. Traffic can be directed from a Facebook page to give the consumer more information about the products, and then sent to the sales site. While Runwaysites may seem to be most beneficial to small businesses, medium-sized companies can also use these, especially during a transitional period. Perhaps a business does not have the need or funds for a full website right away, but knows they will in the future. Runwaysites are the perfect stepping stone. Your brand will build its online presence, or get a professional-looking upgrade to an old site to attract the customers your businesses wants and deserves. When it comes time to transitioning into a full site, a Runwaysite can still be used as an event website to ensure the original investment remains useful. Interested in a Runwaysite? Take a look at some sites to get an idea of what yours could look like. 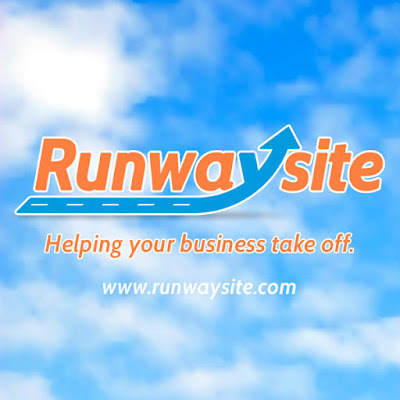 Does Runwaysite sound like the perfect solution for your brand? Hit us up, and we'll be happy to chat!